Abstract: This paper describes the dasycladales green algae from two sections of the Rhaetian Howz-e Khan Member of the Nayband Formation, northwest of the Dig-e Rostam motorway service area (south of the type locality of the Formation near the town Naybandan). Both sections are composed of bedded fine-grained limestones containing partly abundant dasycladales algae associated with foraminifers, which are mainly aulotortid types. Additionally scattered samples were collected from several beds of the Howz-e Khan Member in this area. The following dasycladalean taxa are described: Chinianella carpatica (Bystricky), Griphoporella curvata (Gümbel), Griphoporella lutensis nov. sp., some undetermined dasycladacean taxa, problematic algae like Lithocodium aggregatum Elliott, Bacinella irregularis Radoicic, and Thaumatoporella parvovesiculifera (Raineri). While Chinianella carpatica is not numerous and the other described algae are rare, Griphoporella curvata is extremely abundant in the investigated material. This paper describes Ch. 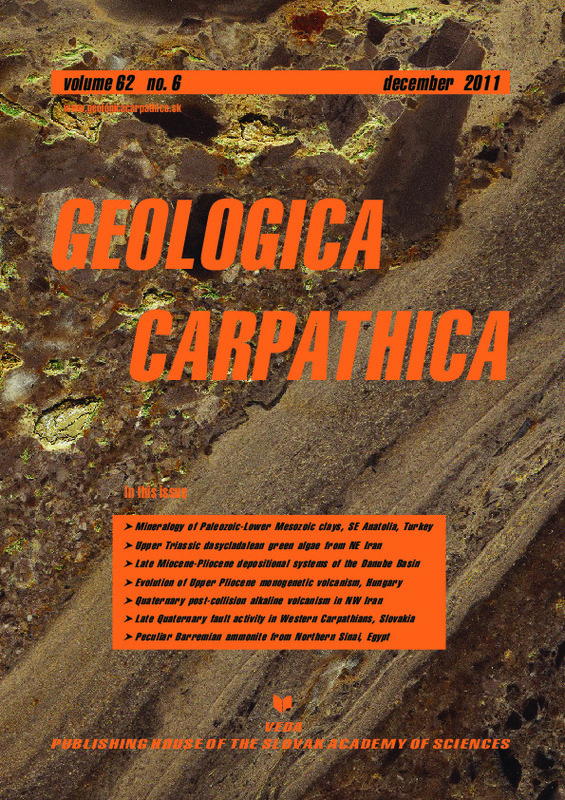 carpatica for the first time from the Triassic of Iran and also includes a discussion of the strong variability of G. curvata. Additionally we include an informal description of a problematic fossil (animal: shell fragment? ; plant: alga?). Abstract: Monogenetic, nested volcanic complexes (e.g. Tihany) are common landforms in the Bakony–Balaton Highland Volcanic Field (BBHVF, Hungary), which was active during the Late Miocene up to the Early Pleistocene. These types of monogenetic volcanoes are usually evolved in a slightly different way than their “simple” counterparts. The Kopasz-hegy Volcanic Complex (KVC) is inferred to be a vent complex, which evolved in a relatively complex way as compared to a classical “sensu stricto” monogenetic volcano. The KVC is located in the central part of the BBHVF and is one of the youngest (2.8–2.5 Ma) volcanic erosion remnants of the field. In this study, we carried out volcanic facies analysis of the eruptive products of the KVC in order to determine the possible role of changing magma fragmentation styles and/or vent migration responsible for the formation of this volcano. The evolution of the KVC started with interaction of water-saturated Late Miocene (Pannonian) mud, sand, sandstone with rising basaltic magma triggering phreatomagmatic explosive maar-diatreme forming eruptions. These explosive eruptions in the northern part of the volcanic complex took place in a N–S aligned paleovalley. As groundwater supply was depleted during volcanic activity the eruption style became dominated by more magmatic explosive-fragmentation leading to the formation of a mostly spatter-dominated scoria cone that is capping the basal maar-diatreme deposits. Subsequent vent migration along a few hundred meters long fissure still within the paleovalley caused the opening of the younger phreatomagmatic southern vent adjacent to the already established northern maar. This paper describes how change in eruption styles together with lateral migration of the volcanism forms an amalgamated vent complex. Abstract: Major and trace elements and Sr–Nd isotopic data are presented for the Quaternary alkaline volcanism NW of Ahar (NW Iran). The exposed rocks mainly consist of alkali basalts, trachybasalts, basaltic trachyandesites and trachyandesites. Alkali basalts and trachybasalts display microlithic porphyritic texture with phenocrysts of olivine, clinopyroxene, and plagioclase in microlithic groundmass. In the more evolved rocks (basaltic trachyandesites and trachyandesites), amphibole and biotite have appeared. Major and trace element abundances vary along continuous trends of decreasing MgO, TiO2, Fe2O3*, CaO, Co, Cr, V and Zn, and increasing K2O, Al2O3, Ba and Th with increasing SiO2. The Sr and Nd isotopic ratios vary from 0.704463 to 0.704921 and from 0.512649 to 0.512774, respectively. Alkali basalts with high 143Nd/144Nd ratio, low 87Sr/86Sr ratio and high MgO, Ni and Cr contents indicate that they were generated from relatively primitive magmas. Ba, Cr and La/Sm ratios versus Rb suggest that fractional crystallization of alkali basalts could have played a significant role in the formation of evolved rocks. Assimilation and fractional crystallization modelling, as well as Rb/Zr, Th/Yb and Ta/Yb ratios clearly indicate that crustal contamination accompanied by the fractional crystallization played an important role in petrogenesis of the trachyandesites. The small compositional differences between magma types, isotopic composition, mineralogy and nonlinear trends on Harker diagrams also indicate that magma mixing was not an essential process in the evolution of the Ahar magmas. Petrogenetic modelling has been used to constrain sources. Trace element ratio plots and REE modelling indicate that the alkali basalts were generated from a spinel-peridotite source via small degrees (~2.5%) of fractional melting. Abstract: The Cenozoic structure of the Western Carpathians is strongly controlled by faults. The E-W striking Vikartovce fault is one of the most distinctive dislocations in the region, evident by its geological structure and terrain morphology. This feature has been assumed to be a Quaternary reactivated fault according to many attributes such as its perfect linearity, faceted slopes, the distribution of travertines along the fault, and also its apparent prominent influence on the drainage network. The neotectonic character of the fault is documented herein by morphotectonic studies, longitudinal and transverse valley profile analyses, terrace system analysis, and mountain front sinuosity. Late Pleistocene activity of the Vikartovce fault is now proven by luminescence dating of fault-cut and uplifted alluvial sediments, presently located on the crest of the tilted block. These sediments must slightly pre-date the age of river redirection. Considering the results of both luminescence dating and palynological analyses, the change of river course probably occurred during the final phase of the Riss Glaciation (135±14 ka). The normal displacement along the fault during the Late Quaternary has been estimated to about 105–135 m, resulting in an average slip rate of at least 0.8–1.0 mm•yr–1. The present results identify the Vikartovce fault as one of the youngest active faults in the Central Western Carpathians.